Tonight’s post is on finishing a series, and I’m writing this because I just finished writing a series. All told, I ended up writing five books existing within an interconnected futuristic parallel universe (Say that five times fast!). Although the final book is still in its rough manuscript form, it feels good to be finished with the characters and settings I’ve been developing for over two years now. Sure, there’s some editing, but the basic storyline, at least in my eyes, is told. I never intended on writing a series: It’s true. I had an idea for a single book and other ideas came to me as I wrote it. Then it was supposed to be three books. Then four. And then finally five. I know it won’t be six, but the ending is perfect as it is. I assume that this happens to others as well. I look back shamefully at the first book: Don’t get me wrong. Most people seem to think that the first book is well written, but when I look back at it, I see a style of writing much different than how I write now. Have a map not a plan: For me, my best writing comes to me when my creativity is uninhibited. I know that probably sounds strange because I promote such a technical approach, but when it comes to plot and storylines, it’s true. For the plot of the story, I like to know where I am and where I’m going. That’s it. I let creativity and the characters take me from A to B. 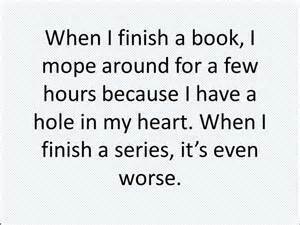 That might be why I didn’t stop with the one book. I kept seeing other possibilities. It’s good to listen to your readers: I got some of my best ideas from reviews that I read, talking to friends who read my book, and listening to my wife’s criticism (well, at least the criticism about my books). You can change the order: I made my second book my first book. Don’t give up? : I know that all writers think about giving up on projects, but I never felt that way with this one. I think its because I didn’t have a plan. I always felt like I was writing something that I was interested in, whether I was developing a previously minor character, creating another plot-line, or adding complications to world of the novels. Moving on feels good: I’m looking forward to smaller projects now. I have lots of ideas that have been put on hold so I could finish this, and am looking forward to writing some shorter-length pieces. This entry was posted on Saturday, April 18th, 2015 at 10:01 AM	and tagged with bargain books, book promo, giveaway, literature, series giveaway and posted in Uncategorized. You can follow any responses to this entry through the RSS 2.0 feed. « Letters on Literary Devices 17: Take a Crappy! Congratulations Eric, it must be no easy task completing book 5 of a series.